"Desert Flats" are the specialties at Frank & Albert's, the latest dining addition to the famed Arizona Biltmore in Phoenix. Executive Chef Todd Sicolo and Chef de Cuisine Conor Favre spent a year "architecting" (their term) irresistible gourmet comfort food from the finest local ingredients. 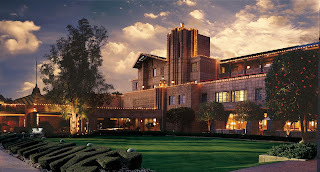 Having stayed at the Frank Lloyd Wright-Albert Chase McArthur-designed resort, I wouldn't expect anything less. Chef Conor generously shared this one with us. Sweat the onions on low heat for 5 minutes then add all the liquid ingredients and reduce on medium heat for approximately 30 minutes or until there is very little to no liquid left. At that point, add sugar to melt and pull off the stove and cool. 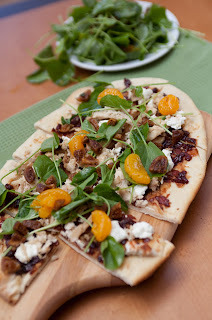 Smear flatbread with onion marmalade and place chicken meat and goat cheese on top. In a bowl, toss watercress, oranges and figs with the olive oil, salt and pepper to taste. Set aside. Heat oven to 400 degrees. Cook flatbread and its toppings in the oven for 3-4 minutes. Cut into small squares and top each off with watercress, fig and orange mixture. On second thought, better make two. Sweet and spicy, that was the late, great Alice Jensen of Sulphur Springs and Dallas, Texas; Boulder, Colorado; Panama Canal Zone; Pt. Barrow, Alaska; Pebble Beach, California; Diyarbakir, Karamursel and Izmir, Turkey; and Bremerton, Bellevue and Silverdale, Washington (Her beloved husband Ralph was a naval officer who kept flunking retirement). Dubbed "Miss Baby Alice" by her Texas nanny, like many people who hate to cook, she served wonderful meals. After all, if you don't like doing it, you aren't going to bother unless the results are worth the trouble. 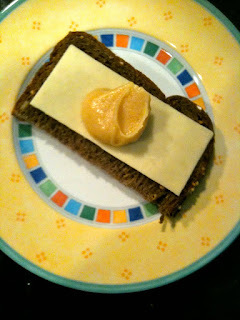 This sweet, spicy mustard, which we all referred to as Baby Alice Mustard, was one of her specialties. I first tasted it in Bremerton, have made it for 40 years and have no idea where it originated although I know it wasn't with Alice. Having tried it with almost everything except ice cream, I am eternally grateful to whomever it was. A dab takes smoked salmon, sausages and cheeses to a whole new dimension. The recipe is easy to make and can be doubled. The results must be refrigerated but keep indefinitely. In a heat-proof bowl, beat the eggs well then stir in everything except the butter until smooth. Cook in a double boiler over hot water, stirring constantly. This will take awhile, so have something to read or watch. When the mixture reaches the consistency of mayonnaise, stir in a lump of butter the size of an egg. Stir until thoroughly dissolved and mixed. If not using immediately, turn into a container, seal and refrigerate. When you have 10 restaurants, 600 employees and three lodges worth of hungry skiers in addition to the day trippers, food can be a challenge but the team at Deer Valley Resort in Park City, Utah, is more than up to it. The resort is consistently ranked number one in food and beverage by readers of SKI magazine and Zagat Restaurant Guide. This recipe shows why. Three women get credit for sharing. Julie Wilson, Deer Park's director of food and beverage and a grad of La Varenne Cooking School of Paris, won the Utah's Golden Spoon as 2009 Restaurateur of the Year. Jodie Rogers, Snow Park and Empire Canyon Lodges executive chef, has been a professional chef for 15 years and was on the gold medal-winning teams at the Australian Salon Culinare Restaurant of Champions. Heather Prine is Seafood Buffet chef. Duck eggs are not normally found in our neighborhood grocery stores but when they are, this is how to prepare them and wow your guests. 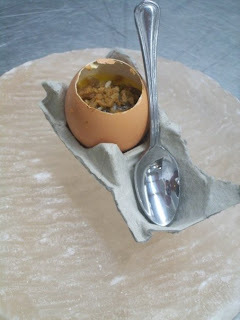 Crack top from duck eggs and empty, reserving yolks and shells. Whisk together cream, yolks, 1/4 cup of the brandy, salt and pepper. Saute the chopped shrimp and shallots, deglazing the pan with the remaining brandy. Season to taste. Scoop into the shells, stopping about halfway up. Heat the oil, stir in the flour and cook, stirring, until dark brown in color. Saute the peppers, onion and celery in a small amount of butter. Add the shrimp and deglaze the pan with the stock. Add roux to thicken then add file, salt and pepper. Top egg custard with gumbo mix and bake in a water bath for about 30-40 minutes until firm. Elevating a comfort food to gourmet levels is a hot trend that I guess we can attribute to the economy. 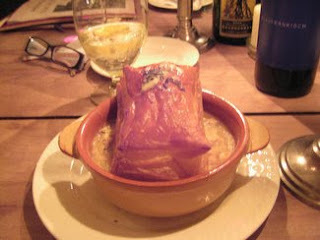 This high-falutin' version of chicken pot pie we can definitely attribute to Chef Eric Gabrynowicz at the Tavern at Highlands Country Club in Garrison, N. Y. "Uncommon pleasure" is how a New York Times reviewer described dining at Tavern, named by Esquire magazine as one of the 20 best new restaurants in the USA. Try it and let me know how you rate it. Season the bird with salt, pepper and pat with softened butter. Roast the chicken at 500 degrees for 15 minutes, then lower the oven to 350 degrees for 15 minutes. Pull the bird our and let it rest. After resting pull the meat off the bone. In a rondeau (Dutch oven), re-roast the chicken carcass for 10 minutes at 350 degrees. Add thyme, one sliced onion, one sliced carrot, and Chicken Broth to cover. Simmer this for 30 minutes. This will give you a nice roasted stock to make the bechamel. Add the carrots, parsnips and rutabaga to a wide bottom skillet and glaze in butter on medium to high heat with 2 cups chicken stock, adding salt and pepper to taste. Roast the cipollini onions in olive oil in a hot saute pan until caramelized. Finish them in the hot oven for about 5 minutes. Do the same with mushrooms. Melt 1/2 lb butter and 1/2 cup olive oil in a large saute pan or rondeau and gently add the flour stirring slowly and consistently with a wooden spoon until there are no lumps. Cook on medium heat for 2-3 minutes and pour in the 2 quarts roasted stock and 1 quart milk. Whisk aggressively until smooth. Turn the heat to low and continue to stir and cook for about 5 - 7 minutes. Turn off the heat and fold in the pulled chicken and vegetables. Aggressively season with salt and pepper. (The flour and milk will have masked whatever seasonings you added earlier.-) Chop four sprigs of rosemary and saute in 2 Tablespoons butter and add to the mixture. Take mixture of chicken, vegetables and bechamel and pour into a crock. Bake frozen puff pastry brushed with a mixture of one whipped egg with a bit of water on a sheet pan until golden brown. Scoop and serve into desired portions and top with a square cut piece of the baked puff pastry. Cheeca Lodge & Spa at Islamorada in the Florida Keys, long has been a destination for serious anglers with a taste for the laid-back, luxe life. 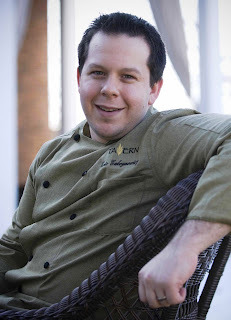 The facility closed for remodeling and re-opened in December with a new concept chef, Dean James Max. Known for his modern American seafood, he's been recognized as a "Great Regional Chef of America" by the James Beard Foundation. That won't mean a thing, though, if the fish isn't good. Reading through the ingredients and prep of the snapper recipe he shares with us, I'd say you can count on the fish being superb. Heat a heavy cast iron or cold steel pan over a medium high flame. Add a couple tablespoons of olive oil and let it get hot. Season fish with salt and pepper. Place fillets skin side down in the pan, saute for two minutes and turn the heat down to medium. Cook the fish for an additional four minutes, flipping it over for the last minute. 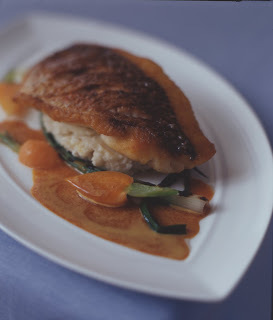 The snapper will continue to cook as you plate and bring to the table. Plunge the green onions into boiling salted water for 20 seconds then transfer them to a bowl of ice water. Do the same with the peeled baby carrots, adding an extra minute of cooking time. When ready to serve, warm them up in a saucepan with a tablespoon or so of olive oil, salt and pepper. Peel and place potatoes in salted water with the juice of one lemon. Boil until the potato is tender. Strain immediately and pass it through a sieve or just mash. Bring cream to a boil. Fold the cold butter into the potatoes until it is incorporated. Add the boiling cream and season with salt and pepper. Finish with a squeeze of fresh lemon juice. In a saucepan over medium heat lightly saute the chopped shallots and garlic. De-glaze with orange and carrot juice and bring to a boil. While waiting, toast the cumin and coriander in a dry pan and blend into powder in a spice grinder. Add the spices to the boiling juices. Reduce by half and add the chicken stock. Reduce the mixture by half again. Whisk in the butter, juice of one lime and season with salt and pepper.